Ashiki was eleven days in Mooloolaba thanks to a certain category 5 cyclone up Rockhampton way, then we were off with the next Nor’Easter. 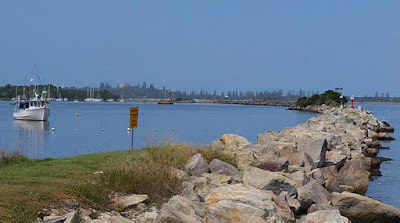 Mooloolaba is definitely a fun place packed with all sorts of goodies, but we had, as rough as it was, a schedule to keep. We decided to bypass the rest of Queensland, no Brisbane, no Gold Coast, places we would like to cruise next time, instead we found the East Aussie Current. It found us, more like it! Winds dropped to a zephyr but the GPS still had us a 4.5 knots.. We did see a fisherman’s buoy 5 or 6 miles off the coast, it was almost submerged with the current washing over it. It as a good 180 miles to Iluka in northern NSW but Ashiki covered 110 miles the final 24 hours. A record! (lot of exclamation marks this paragraph!). So teepee the auto pilot decided to act up and blew fuse. As I was out of 10A fuses the rest of the way was under windvane. Still in the sleigh ride, the Clarence River mouth hoved into sight and Ashiki was turned towards the coast, there is supposedly a good swell over the bar but considering the light winds I guessed it would be alright and wasn’t worried with a night entrance. Our entry would be against an ebb flow too, but the wind would be behind us so I still thought we’d be okay. 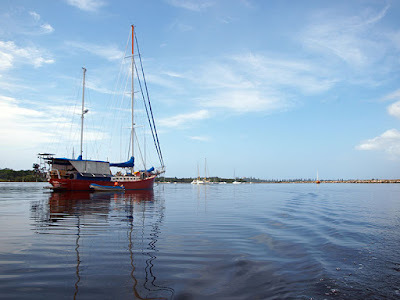 With just the foresail up and motor assistance Ashiki did the job making 2.5 knots despite the 2 knot counter current and we found ourselves anchored in Iluka’s fishing boat harbour. It was very pleasant 6 days spent in Iluka, Ashiki’s first taste of the mighty New South Wales, meeting up with the crew of the 46’ homebuilt cat “Imagine” whom we had met in the Kimberley. The pub on the bay with views of our boat is a very fine spot indeed. Several beers and pub meals were had during our 6 day stay. Armed with a functional teepee (and a handful of 10 & 15A fuses) we set sail south, heading straight out to sea in search of the current. When Ashiki’s instruments showed signs of radical leeway to starboard, meaning - we hit the current and our cue to turn south. In a light Nor’Easter which I would expect us to cruise along at 2 to 2.5 knots, Ashiki started off at 4 to 4.5 settling at 5 knots a few hours later. Passing Coffs Harbour around midnight we were making such good time we didn’t want to stop. Early the next day Teepee gave up. The fuse didn’t blow (15A this time, spec is for 12A but can’t buy those), its pushrod froze. Comprehensively kaput. So back to the windvane again. 10:30pm on the second night, a fresh breeze was blowing from astern and a following swell was building. At this point the current wasn’t assisting much but Ashiki was still romping along at 4.5 knots. Such conditions puts pressure on the rudder and the tiller begins to throw itself around. This is why tiller pilots don’t last more than a few months on this boat. Anyway, the tiller would often control the vane rather the other way around, being directly connected, flicking the vane over quite violently. At this time while below I heard a mighty “crack”, peeked out the companionway and saw no windvane. Then found it trailing off the stern still attached by its two sets of control lines. It had severed at the wooden base from the top of the post. So much for that, both forms of auto steering gone and neither of us wants to sit in the cockpit hand steering through the night. It is a following wind and Ashiki only steers herself with the tiller lashed if the wind is forward of the beam (roughly to windward). Motoring was out of the question, since that requires steering. It’s either hand steer or heave to. We chose the latter, opting for a good nights sleep. cut it in half, added 10' of steel plate and welded it back together, extending the waterline by 10'. Viola, bigger boat. Laying in the bunk with Ashiki drifting half a knot southward I was thinking to myself that there must be a way for this boat to sail itself downwind. It’s a junk schooner with 2,000 years of development behind it, dammit, and everything we found about it handling wise has been quite amazing. Then I had what you might called a eureka moment, jumped up and headed for the cockpit. I let the mainsail out, 90˚ to the hull and sheeted the foresail in, hard, boom pointing fore and aft, lashed the tiller to the middle and sat back and watched. The boat would pick some speed downwind then try to round up, turning to port. As the wind spilled a little from the main it would catch the sheeted in foresail and push the bow back downwind again. It worked. Ashiki was mooching along, picking up speed, trying to round up then back downwind again. Not going fast, not the previous 4+ knots, but she’s managing 2.5 to 3 knots in the direction we wanted to go. I knew there was a way! Incidentally, this is actually the same setup for steering downwind when the swell picks up and we want to minimise rolling. Lucky we built a schooner, no way we could do this with a sloop. In the morning we started hand steering, holding 3.5 knots, then the wind swung to the SW which meant windward sailing where Ashiki can very efficiently sail herself with tiller lashed. We spent the rest of that day below reading and drinking tea. Normal sea life. It didn’t seem to matter being without any form of functioning auto steering devices. At this stage it was decided to make landfall at Port Stephens, heard it was a beautiful place and besides, I could get cracking on the windvane repairs. This would make it a good 3 days voyage from Iluka. That night we had an interesting conversation on the VHF. First we heard on ch 16 someone calling to a vessel SE of Seal Rock. Wasn’t us, we’re definitely NE of Seal Rock. Five minutes later there’s a call for the sailing vessel NE of Seal Rock. Ah, someone wants to chat with us. I answer him and he says he’s on a sailing catamaran nearby and for the past half hour he’s been try to figure out which direction we are heading. Happens he had a beef with the non standard lighting we are showing. It’s true, we deliberately sail at night with not exactly “Collision Regulation” lighting. We’re supposed to only show our three navigation lights (red, green and white on the stern), which we do. But we also have the bright white anchor light on the mast head. Reason being, it works, huge ugly supertankers change course around us, we are really happy with that. It’s a fairly common thing to do, having seen other sailing vessels do the same. It could be a topic for a hot internet debate, but I got the idea from a cruising book, the “Pardeys” always sailed this way. But everyone has their opinion I supposed. I think this guy on the cat was a stickler for rules. So I popped my head out the companionway and looked around, couldn’t see nought in the blackness. Eyes still accustomed to the cabin lighting I suppose. Then roughly 200m abeam of us I saw a faint dark grey triangle shape in the gloom. That was him. No lights at all, huh? Then I saw it, a very faint spec, a reddish dot towards the stern of his hull. That was it. His lighting. The guy’s boat was almost invisible! My god, I had a little chuckle. I didn’t point this out, not wanting a flame war on ch 16, I told him we’re aware we sail with the anchor light lit and that’s how we do it. He signed off and that was the end of it. Next day, midday we dropped anchor in Shoal Bay, in the lovely environs of Port Stephens.